Beautiful beaches.... a real vision! The quality of the water at the beaches of Mallorca is good up to brilliant. Every year there are about 30 beaches wich are asigned wiht the "Blue flag", wich is been awarded by the Foundation for the Environment of the European Union. 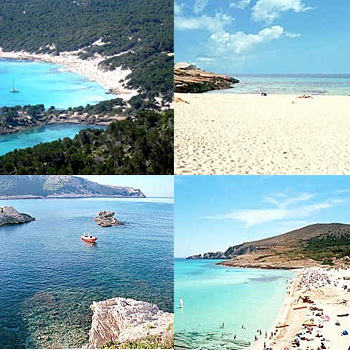 Around Artà you will find many of those beautyful beaches as well. The family-friendly Cala Mezquida, the lively beach Cala Agulla, the quiet bay of s'Estanyol and the Cala Torta with its delicious fish specialties – just to mention some of the beaches.... You will find your perfect place at turquoise water of the Mediterranean. As Artà is situated amidst the beautyful landscape of the Sierra de Levante, you will find several tours for hiking and bicycling in the nearest sourounding. 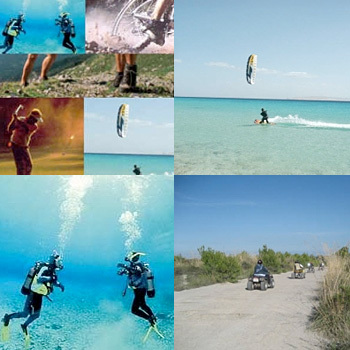 The best place to do kite surfing or to learn it, is at Son Serra de Marina, which is about 20 minutes away from Artà by car. After sports you can get delicous food and drinks at the Sunshine bar with seaview! The diving scool Mero Diving is situated in Cala Ratjada, which you can reach within 10 minutes by car. At the same place you find the bar Sa Cova wich offers good food, cold drinks and a beautyful view. A very ynice place to be! On January 16th, at eight o'clock in the morning, there is a breakfast of hot, thick drinking chocolate and ensaimadas, held at the Fund's headquarters. 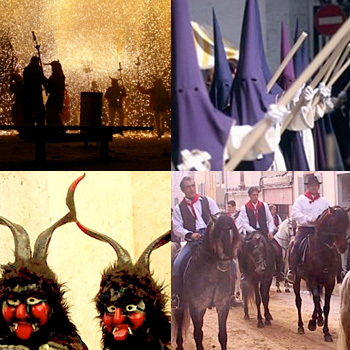 Afterwards, with the musicians, who will have already been sampling Muscatel wine and mixed sweet and dry hierbas Mallorquines (a local liqueur), there is a parade round thetown in the company of the celebrated and emblematic pair of daemons, symbols of evil and human temptation. In the afternoon, at compline, fragments of the Life of the Saint are read out, and the appropiate hyms for the fiesta are sung. In the evening, at the bonfires lit all around the town, singers entertain the crowds with traditional folk song (gloses), many of which either are rude or have a sexual content, protected by the impunity conferred by the celebrations in which anything within traditional limits goes: on this night of fire and daemons everyone has carte blache. On the following day, January 17th, the cavalcade is held, with the obligatory blessing of domestic animals and pets, and horses are let loose in the streets, all of which takes place under the patient gaze of the figure of Sant Antoni, who is seated on a donkey and besieged by daemons. After the mass a the end of the fiesta, the time for the declamation arrives; this is a composition by a glosador that sums up the events of the previous twelve months in song, The Carnival celebrations, just before Lent, are worthy of mention, with the high points being on the Tursday and Tuesday before Ash Wednesday, when tradition demands that the people change into fancy dress and parade round the town, singing grotesque songs to the sound of ximbomba (a traditional instrument that makes a constant lowing sound. It resembles a drum with a redd protruding from the centre of the drum skin). In the heat of the summer, the fiestas of the patron saint, Sant Salvador, are very popular and many people take part. These take place during the first week of August and have a full programme of a variety of activities that appeal to one and all. The participation and involvement of both local people and visitors is something that stands out. An intense week of fiestas, games and cultural activities. At Easter, the Processions on Easter Thursday and Good Friday take pride of place, with religious floats displaying scenes and figures from the Passion and numerous hooded penitents wearing the traditional caped robes. A spectacular sacramental ceremony in the sanctuary of Sant Salvador puts a close to the acts of Good Friday, as Christ is taken down from the Cross and a magnificent procession to the parish church ensues. The fiestas of Sant Antoni of Padua (known as Sant Antoni of the Apricots) on June 13th also have popular support. Two red and two black hobby-horses and a Lady with a white horse dance to the sound of music, while children, dressed in special brightly coloured robes, caper the ancient steps of strangely named dances: the Carriage Dance, the Dance of the Indians, the Dance of the Dwarves etc. The fiestas dedicated to Sant Pere (Peter), the patron saint of Colònia de Sant Pere, are, one might say, what marks the beginning of the summer season with its games and leisure activities there. A beautiful course with six lakes and lies hidden in a spectacular valley surrounded by mountains. It has a very balanced design, with some long and wide fairways and some which resemble narrow corridors and require more accuracy on the shots. It is suitable both for beginners and for more expert players. It has a clubhouse and a prestigious school where classes are given all year round. Canyamel golf club is situated on the Urbanización de Canyamel residential estate, on the east of the island of Palma de Mallorca, in the municipality of Capdepera, which can be said to be one of the most beautiful parts of the island, and there are magnificent views of the sea. 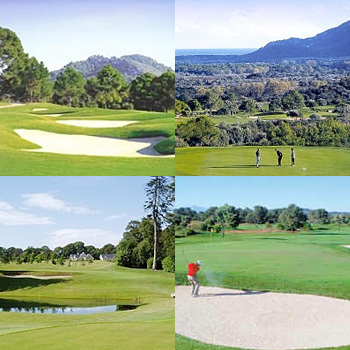 The golf course of Son Servera is the first course that was developed in this region of the island of Mallorca. That was twenty-nine years ago and since then many players. The course itself is difficult, although it is fairly flat, and the holes are very close to one another. The main difficulty of their course, built in a real pine forest, is that the fairways are extremely narrow. Pula Golf is very demanding. All of the holes are different. Two lakes and a river affect several holes. The 11th, a par-3 of 201 metres, is the most difficult of the course, and the longest are the 8th (558 metres) and the 13th (545 metres). In the surrounding area visitors can admire the archaeological remains of the Talaiotic era.